Water is not unlimited on this lowly little blue ball we live on. A lot of people are quickly discovering this fact as drought and overpopulation sweep many areas into water limitations. Water has become so scarce in some cases that the cities have begun mining aquifers, or drilling down to attain more water than the aquifer would provide naturaly. Still other areas are hammered by flooding, causing a lot of water sources to become contaminated by industrialization and undrinkable. Here is one explantation of our present crisis that should put everything into persepective: While 70% of Earth is covered in water only 2.5% of that is actually fresh water. Now consider all that is locked in the glaciers and permafrost or in gas form floating around the atmosphere. That doesn't leave much drinkable water for the burgeoning population of the planet to include all of the other species that also must consume water to survive. Obviously, the best most obvious answer is to conserve water. Planting a wildflower garden is one small step in this direction because native wildflowers don't require the watering that exotics do and a Rain Garden locks rain water into the ground. But the next best answer is to install a rain barrel. 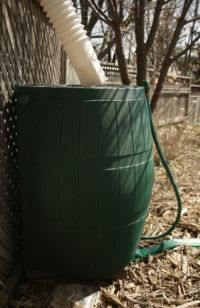 A rain barrel is a container placed under the downspout from your guttering. These barrels are generally covered with screens or a system of tubes to prevent leaf litter and mosquitoes from getting into the water. The rain barrel captures the rain water, which is naturally clean and full of minerals. This water can then be stored and used to water gardens later in the season, when rain is more sparse. Just think, in a mild drought when your neighbors are on rations and watching their gardens wither and die, you'll have barrels full of free water to keep your own blooming all season. The Rain Barrel is not a new idea. This is actually an idea that is recently being resurrected. People 2000 years ago collected water in clay jars to be used during drier times. Now we can employ this very practical system once again in time of great need. There are any number of chemical contaminates on you roof depending on what material it is comprised of. Rain water will of course pick this up as it rolls down into the barrel. Trees and other plants are for the most part immune to these chemicals, but you may not.